On Thursday last week we went to see "Zoo Lights" at the Phoenix Zoo. The sign over the water. Finally past all the signs!! This is Naomi in front of the cafe (looking spooky under the many lights). We stopped for some snacks as it was dinner time. Chloe waiting for her french fries. We quickly ate some food and then onwards to the lights! And an amazing light spectacle over the pond. This baby Komodo dragon was one of the few animals you could view during Zoo Lights and he was sleeping! My only picture of Phoebe that night. This is some kind of warthog. This is the amazing spider web! That's Mike underneath the amazing spider web! And here's a preying mantis. Zoo lights was a lot of fun. I know people think this is a good thing to do with little children, but my teenagers had a great time, so I think it's for everyone. 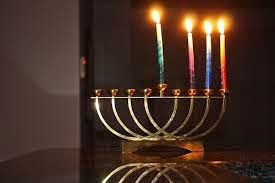 Tonight is the third night of Hannukah. For the last few nights we've had a guest staying with us. It's one of Chloe's school friends who's Mom kicked her out of her house. She's been sharing Hannukah with us so far.